Mission: Connect local merchants and consumers through structured data. 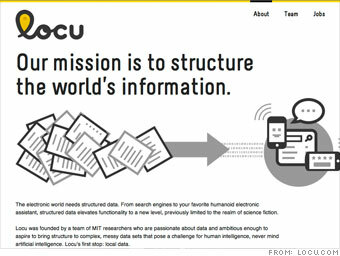 Locu says its mission is "to structure the world's information," and it's throwing some serious firepower at that challenge. The startup hatched in Tim Berners-Lee's laboratory at MIT and was built by a group of engineers with experience at Google, Microsoft and Sun Labs. "Structured data is important for the way search is going," co-founder Rene Reinsberg told CNNMoney. Right now, the crew is looking to use its search technology to help businesses and consumers connect. Locu's first product, MenuPlatform, takes aim at a pain point plaguing restaurant owners: Keeping online menus current. MenuPlatform lets restaurateurs scan or import their menu, then spreads that information to websites and (coming soon) mobile apps. Locu has a list of heavyweight backers. It recently secured a $4 million funding round led by General Catalyst Partners. Other influential backers include SV Angel, Lightbank, and a host of angel investors. A venture capitalist's quest to capture whale song gave rise to an innovative fleet of data-gathering robots.